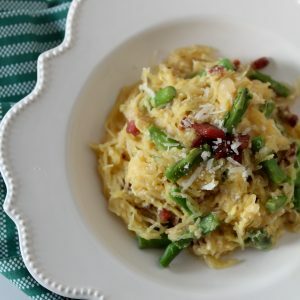 I am sooo late to this spaghetti squash game you guys. Which isn’t surprising to anyone that knows me, because I am always late everywhere. Preschool, gym, to bed. I’d like to be able to blame it on my kids and kids alone but truth be told I am part of that issue. Clearly, getting two opinionated kids out of the house doesn’t help the cause. Even before kids though, I was the one that changed my outfit 20 times before we went out. I took my time sipping that last drink and had to listen to Single Ladies one last time before we bounced. So it’s no surprise that I was late to this spaghetti squash party that everyone has clearly been at for days. But I’m hooked now. It is just so easy, I can’t believe it. The only drawback to spaghetti squash I can see at this point is that these guys are damn dangerous! No joke man. I swear it’s going to be within the next 10 spaghetti squash meals that I slice an entire finger off cutting that thing open. Good God! Be careful out there fellow chefs. Vaya con dios! I digress. 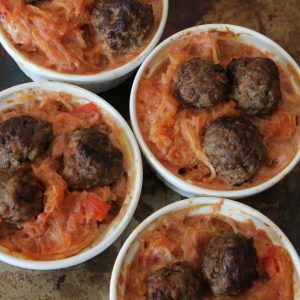 I wanted to create a hearty sauce using some of the ground meats that we’ve had in our freezer and something that would hold up well against the squash. 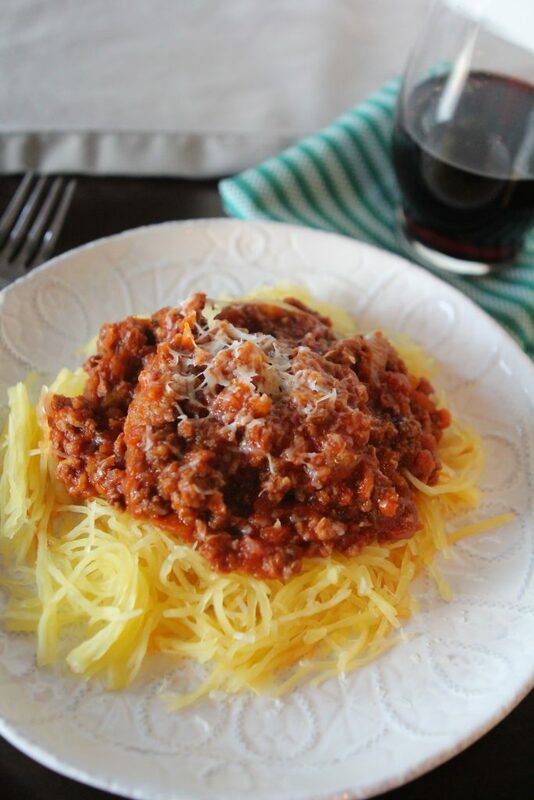 My husband always used to make an awesome bolognese that we loved so I thought I would give it a few tweaks and viola! Along the way, I picked up a couple of tricks to pull some more flavor out of ingredients. One trick I picked up this time around was putting the carrots, celery and onion into a high powered blender to give it a good fine “go”. I roughly diced those ingredients then added them into my Blendtec and used the “salsa” mode. I didn’t want it to turn into a paste per se, but the stage right before that. It ended up being a pretty fine chop (a mince maybe?) that I wouldn’t have been able to get with just a knife. When I sautéed those ingredients in the pan, I’m convinced more flavor came out because of how I prepped it. Something else I noticed was that other recipes called for adding water as the sauce boiled down in order to reconstitute it while it developed its deep flavors. But water, really? I wanted to be able to use some of the last fresh tomatoes we had in our garden, so I threw those (separately) into the blender until it was totally pulverized and pretty much tomato water. It would serve the same purpose as the water but would clearly add much more flavor. >If you don’t want to add the wine for whatever reason, I’d suggest using some unsweetened cranberry juice instead. I’m afraid most grape juices would be too sweet, but if you have a tart one you like by all means give it a try. 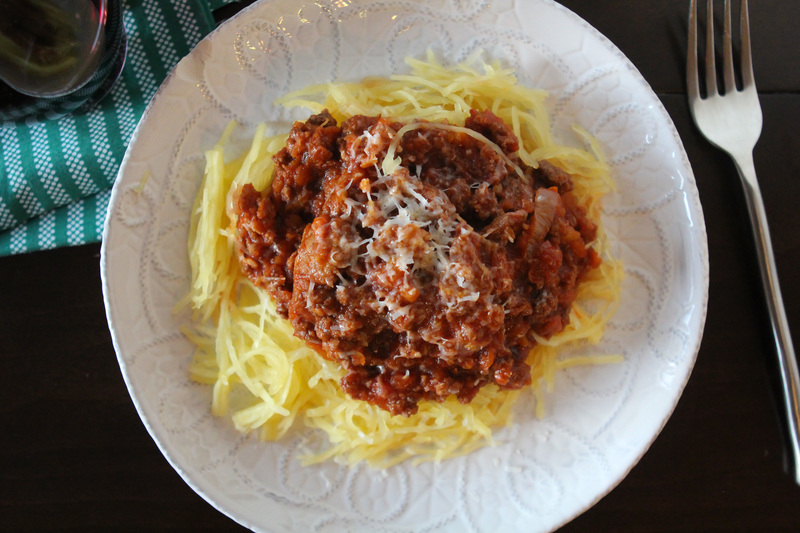 A gluten free, grain free hearty bolognese. In a high powered blender add roughly chopped carrots, celery, onion and garlic. Pulse until ingredients are almost paste like. Add 2 Tbsp of cooking oil of choice to a dutch over or large sauté pan and heat on medium. Add carrot, onion, celery & garlic mixture to oil to heated oil and cook until translucent and aromatic, making sure not to burn the garlic. Push mixture to side of pan and add meats, begin to brown. Once browned, stir all ingredients in pan until meat is cooked through. Add tomato paste, tomato liquid and wine. Simmer on medium low for 45 minutes, continually checking liquid levels and adding more tomato liquid or water if necessary. Slice spaghettin squash in half lengthwise. Scrape out seeds and discard. In a small baking dish, fill with 1 inch of water. Place spaghetti squash face down into dish and microwave for 12-15 minutes (depending on size) until insides are tender and can be scrape withe a fork. Season bolognese with additional salt and pepper to taste. Scrape desired amount of spaghetti squash onto plate. 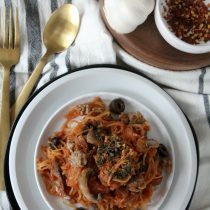 Spoon bolognese over spaghetti squash and serve. Sounds delish! I found a much easier way to cook the squash…pierce the outside a few times with a fork and bake at 350 for about an hour. Once the squash cools a little, it is so easy to cut and clean–and turns out perfect every time, no chance for cutting digits! Haha, you are so welcome!